The Austrian Alps are known for scenic valleys and villages, sandwiched between stunning snow-capped peaks. These valleys often serve as points for jumping off onto endless activities all times of year. One of our favourite places in Austria is Mayrhofen, a great mountain town in the Zillertal region of Austria. Mayrhofen is also one of the most popular tourist destinations in all of Tyrol, whether for skiing in winter or a summer hiking holiday. While there are towns dotted towns dotted along the valley floor on the way to Mayrhofen, we love staying in Mayrhofen, and it is always our choice of where to be based. Mayrhofen is a quintessential Austrian mountain town with everything you need, from small BnB’s to a selection of upscale resorts and classic mountain hotels. There’s also incredible restaurants and a lot to do no matter what season you’re in Mayrhofen. Ready to plan a trip to Mayrhofen this summer? Here’s what you need to know. What’s the Best Time to Visit Mayrhofen? Mayrhofen is a great destination year-round; winter and early spring offer classic Alpine skiing and a growing ski touring scene. 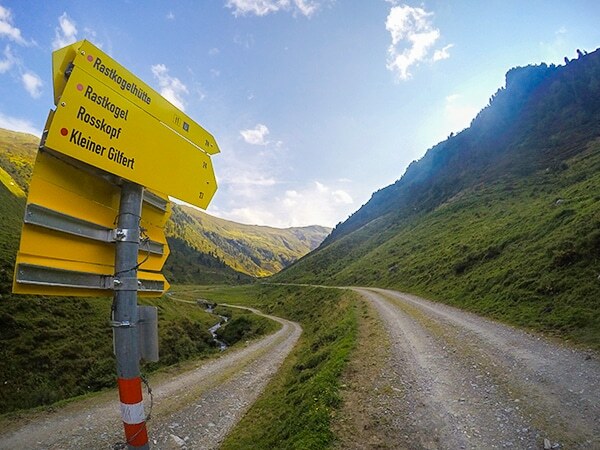 Summer and autumn in Mayrhofen are prime for hiking, mountain biking and swimming. 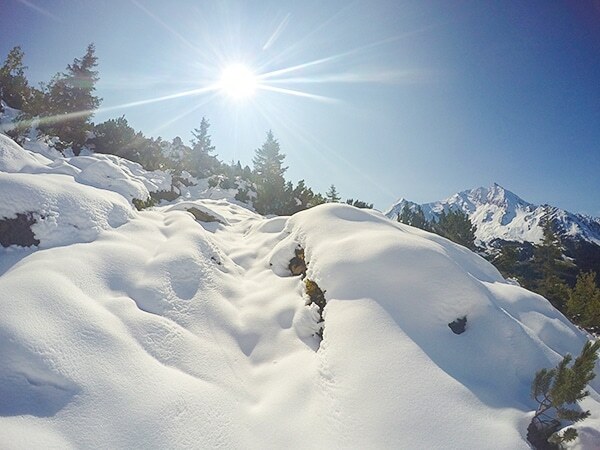 You can expect typical Alps weather year-round, from highs around freezing in winter to 20-25C in summer. Summer is actually the wettest time of year, so be prepared with rain gear before heading out. By Car: Mayrhofen is less than hour’s drive from Innsbruck via A-12 and B169. Take the Inntal Autobahn until the exit for Zillertal, then follow B169 into town. It’s less than 2 hours for Munich (in good weather) via A8 to A-12 and then B169, and 2 hours from Salzburg via A-8. By Bus or Train: Mayrhofen is served by the Zillertalbahn railway, which runs from Jenbach to Mayrhofen. To reach it from Innsbruck, Munich or Salzburzg, take the InterCity to Jenbach and change for the ZIllertalbahn connection to Mayrhofen. By Plane: The closest airport to Mayrhofen is Innsbruck Airport, which has service to and from dozens of major European cities. And it’s only two hours from Salzburg or Munich Airport, which are also connected to all dozens of destinations throughout Europe and North America. Getting Around Zillertal: If you have a car, you can drive between villages and to trailheads very easily. Mayrhofen itself is quite easy to get around on foot, however, and you can easily walk to many nearby trailheads. The Zillertalbahn can also shuttle you between villages. We recommend a car rental, but we do also enjoy the ease and efficiency of European transit. Mayrhofen is the most popular town in the Zillertal, and there’s tons of accommodations to choose from. If you are itching for a truly upscale experience, there is the Hotel Edenlehen im Zillertal – a 4-star hotel with spacious-yet-cozy, bright rooms with classic mountain lodge appeal. It offers mountainside views, a fine restaurant with local and fresh cuisine tailormade from what’s available that time of year. It’s even got a sauna. If you’re looking for Zillertal’s most luxurious experience, this is it. Another option is the Hotel Berghof Mayrhofen. Here you have chalet-style rooms and lodging complemented by a restaurant serving classic Austrian fare and beer garden. There’s also a spa and outdoor pool for summertime dips. It’s also only about a 10-minute walk from the nearest ski-lift. For less strain on the pocket, look to Hotel Garni Montana. Relaxed rooms and apartments in a classic chalet, many with private balconies and a fine Austrian restaurant. If you’re on a real budget, you can try the Landhotel Rauchenwalder; comfortable but casual rooms with mountain views, mere minutes from the trails and 13-minute walk from the Erlebnisbad Mayrhofen pools. We have had great success in small, family run apartments in Mayrhofen, which we usually find on Booking.com. Other scenic villages in Zillertall are Zell am Ziller, Aschau im Zillertal and Finkenberg, all just a few minutes from Mayrhofen. They don’t have all the amenities and food selections but have some great deals on hotel rooms. They’re also a bit quieter. Sampling the local cuisine is one of our favorite activities and Mayrhofen certainly doesn’t disappoint; in fact, it has some of the finest foods we’ve found in a mountain town. For a true fine-dining Austrian experience, you should go to the Gasthof – Restaurant Neue Post, a traditional German-Austrian Gasthof serving up some of the best wiener schnitzel, venison and other classic German dishes in the Alps (though we imagine there is some stiff competition for that honor). They’ve got all the fine wines and German beers you could want, great, fast service and a classy, lively ambience. What more could you ask for? If you’re in the mood for Mediterranean, head over to Pana e Vino De Michele. They’ve got Italian style courses, delicious seafood (try the risotto! ), wine and beer, and plenty of Gluten-Free and Vegan options for anyone who needs them. Might be a nice place to mix things up a little bit! For cheap eats, try the Gasser Metzgerei: located at the bottom of the Penken ski lift, this joint serves a huge assortment of German, Austrian and European sausages, schnitzel, currywust, chicken, beer, fries – whatever you want. Who says food can’t be good, fast and cheap all at once? 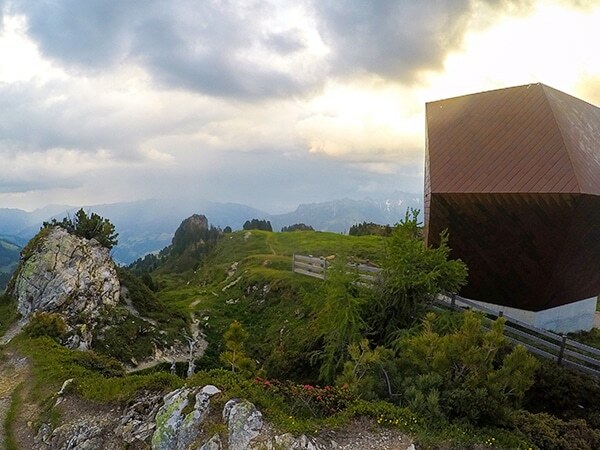 Finally, if looking for some unpretentious and inexpensive food with fantastic views, swing by Wiesenhof while walking up to or down from the Wiesenhof. The views are spectacular, the food and beer delicious, and the service excellent – the perfect refresher after a long walk up the mountainside. 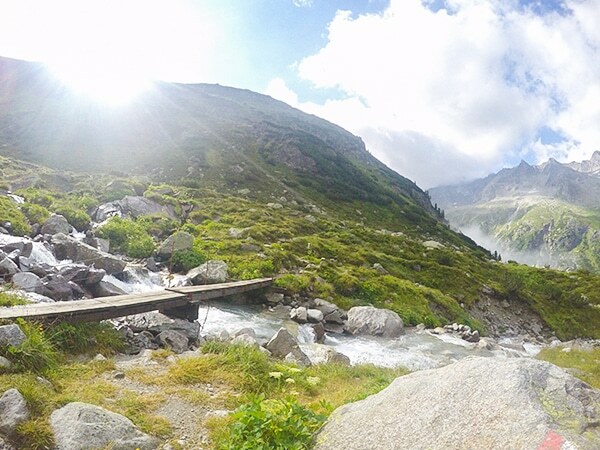 Summer in Zillertal is a serene and beautiful time for exploring the many trails (552km of them) around the valley. Many hikes are made easier thanks to a ride on a gondola, which quickly takes you to the Alpine. 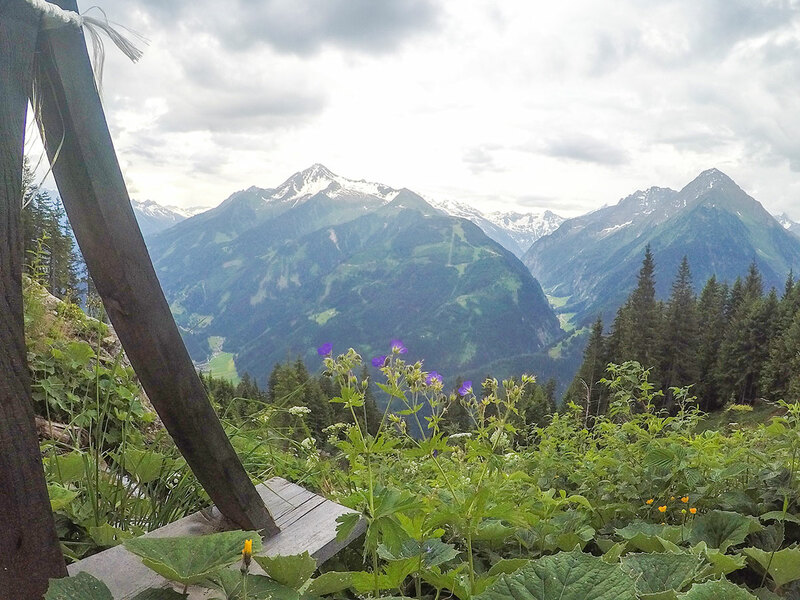 A hike in Zillertal might show you everything from rugged, exposed mountainside to alpine panoramas and green hills coated in wildflowers. 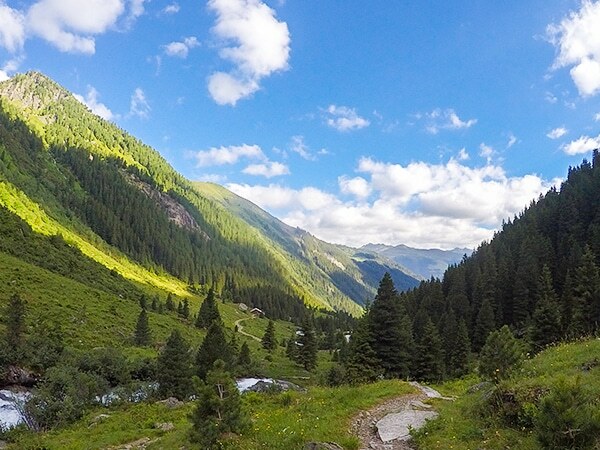 You can see our Top Hikes in Zillertal here; most are a short drive from Mayrhofen and any of the other villages in the Zillertal. 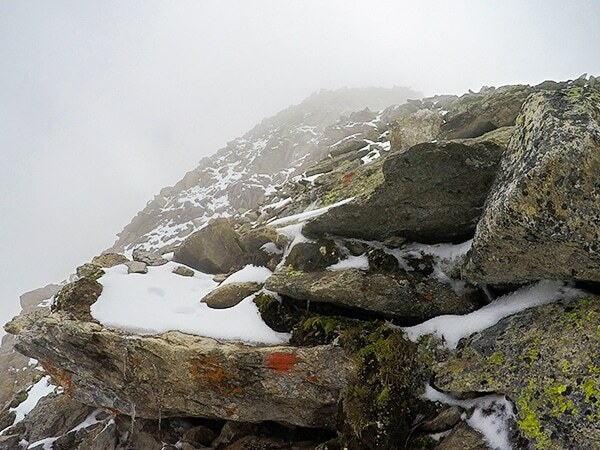 If you want a short but exhilarating hike up to a great view, climb the Ahornspitze. You can take the lift most of the way up, but you then climb a steep-but-beautiful trail over 1100 meters to the top, with epic Alpine views the entire way. 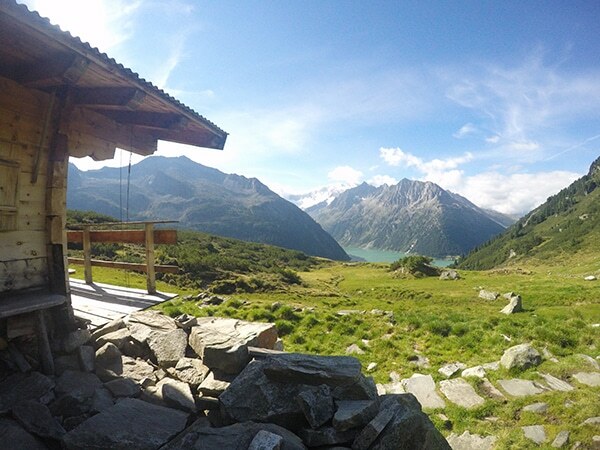 There’s also a place to break at the Edelweißhütte before tackling the last leg of the trip. 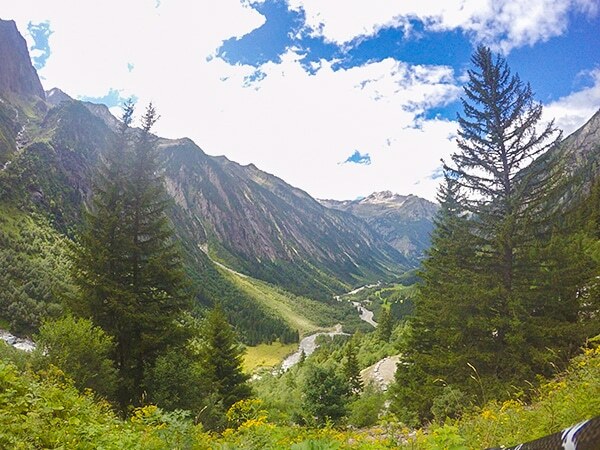 For a family-friendly hike, try Maxhutte – a short hike with great views, a cool and refreshing stream, great views and even the chance to play with goats. Lastly, if you’d like a real challenge, tackle Friesenberghaus and Olpererhütte – steep exposed mountains and a gorgeous alpine lake make the challenge worth it. One of Zillertal’s many attractions is swimming, either in the lakes or in the Erlebnisbad Mayrhofen . This pool and waterpark complex has indoor and outdoor swimming pools, a few waterslides (one of them 101 meters long) and a spa. It’s a great way to cool off after hiking; spend a day relaxing by the pool or pampering yourself in the spa. Zillertal has tons of tennis courts too – both outdoors and indoors, so you can play all year round. And if you want to play on a clay court? Tennisplatz Ried has you covered. Ready for a real thrill? Paragliding is an exhilarating way to experience the splendor of the Alps – from above. Several companies – Stocky Air, Zillertale Flugschule and CloudBase in Rohrerg can hook you up with instructors and equipment to bring your airborne dreams to life. Want the thrill of paragliding but feel like staying a bit closer to the ground? Try a high-ropes course, led by Mountain Sports Zillertal. There’s also rafting and tubing, taking advantage of the valley’s many natural waterways and falls. Mountain Sports Zillertal and AktivZentrum Zillertal both lead guided rafting expeditions, can show you how to paddleboard, and rent out rafts and tubes for a leisurely glide down the river. Fancy some skiing in summer, the nearby Hintertux resort has summer skiing, a nice change on a hot summer day! Zillertal is home to several ski resorts, with over 180 lifts and 530km of perfectly-groomed slopes. The valley is split into four main skiing areas: Hochzillertal / Hochfügen/Spieljoch, Zillertal Arena, Mayrhofner Bergbahnen and Gletscherwelt Zillertal 3000. You could spend an entire season exploring the slopes of the Zillertal Valley. The closest slopes to Mayrhofen are Penken and Ahorn, which are open December through April. A one-day pass starts at 53.50 Euro; you can also purchase a ZillertalSuperskiPass, which gives you unlimited access to all lifts in the Zillertal for 2-21 days as you’d like. What Else Do You Need to Know About Visiting Mayrhofen? If you’re hiking, dress appropriately and bring lots of layer – even in summer. A pleasant sunny day in the Alps can turn stormy and inclement in minutes, and thunderstorms are common on summer afternoons. English is fairly well-spoken in Mayrhofen, but it’s not universal. Practice a half-dozen phrases before you come, and you’ll have a great time. When wandering on some trails and grasslands at lower elevations, you will likely come across goats and other livestock. Some goats are friendly enough to interact with but treat them respectfully and don’t harass them. The tap water in the Alps is some of the best in the world – crystal-clear and fresh, straight from the peaks. Be sure to bring a water bottle or two to refill around town and skip the plastic bottled water. Austria is a good choice. My friends always try to lure me to go with them there. It seems it's not the cheapest option for skiing, but hiking might be great here. 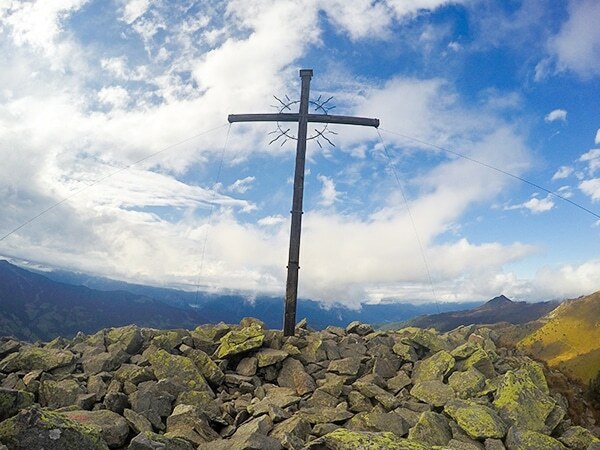 I always consider Poland and Slovakia as well, they have good hikes there in the Tatra mountains.